what is this Privacy Badger update pup up? today i received a peculiar update message that forces me not to update if I do not agree with him, i not understand why and what thats it mean. and not understand if i have to allow twitter to collect my personal data or i have to get permision to twitter for access to my data on this site? sorry i am not fluent in english and not understand well the message and neither understand what is the point of it, what is diferent from before? 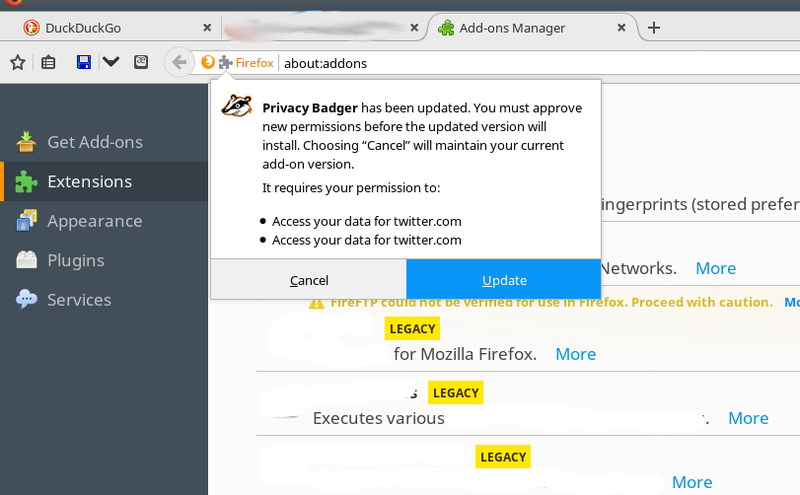 It appears that Privacy Badger will now inject a special content script for pages from twitter.com. Looking at this content script, the purpose is to unwrap the links so as to avoid Twitter from tracking what link you clicked. Good feature. ok thank you because the pop up was not specially clear to me, it means i allow to p. badger for the change not to twitter to collect personal data.